Shopping, dining, sailing, golf…there’s not much that the Mashpee area doesn’t offer. Likewise, there’s no service overlooked by the real estate professionals at Kinlin Grover Real Estate. Whether you’re selling a primary home, looking for a seaside, summer rental or buying or selling investment property, there’s no one better than a Kinlin Grover associate to help you with all of your real estate needs. Kinlin Grover’s Mashpee office, located in the bustling shopping mecca of Mashpee Commons, caters to many special areas on the Upper Cape. From family-friendly neighborhoods like South Cape Beach Estates to the beautiful resort community of New Seabury, our associates have the expertise needed to help you buy, sell or rent your coastal, Cape Cod home. If you’re new to the area, let us introduce you to the variety of places and pastimes enjoyed by our local homeowners. Within minutes, you can catch the ferry to Nantucket or Martha’s Vineyard, kayak at scenic Whippoorwill Beach, fish at John’s Pond or take in the spectacular views of the Mashpee River on the trails of the Mashpee Woodlands. And of course, all ocean activities are only a short walk or drive away. 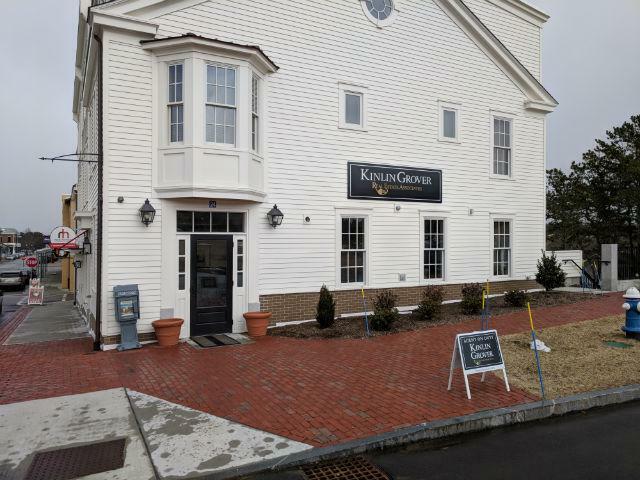 Stop in the Mashpee Commons office of Kinlin Grover, Cape Cod’s leading real estate firm where you will find that our associates will stop at nothing short of excellence to fulfill your home buying, selling or rental needs. After all, at Kinlin Grover Real Estate, exemplary customer service is our main priority.